For the saint to whom this church is dedicated, see Pancras of Rome. For a list of other places named after him, see St Pancras (disambiguation). St Pancras Church is a Greek Revival church in Bloomsbury/St Pancras, London, built in 1819–22 to the designs of William and Henry William Inwood. It was historically often referred to as St Pancras New Church, in order to distinguish it from St Pancras Old Church, which stands some way to the north. The church is on the northern boundary of Bloomsbury, on the south side of Euston Road, at the corner of Upper Woburn Place, in the borough of Camden. When it was built its west front faced into the south-east corner of Euston Square, which had been laid out on either side of what was then simply known as the "New Road". It was intended as a new principal church for the parish of St Pancras, which once stretched almost from Oxford Street to Highgate. The original parish church was small ancient building to the north of New Road. This had become neglected following a shift in population to the north, and by the early 19th century services were only held there once a month, worship at other times taking place in a chapel in Kentish Town. With the northwards expansion of London into the area, the population in southern part of the parish grew once more, and a new church was felt necessary. Following the opening of the New Church, the Old Church became a chapel of ease, although it was later given its own separate parish. During the 19th century many further churches were built to serve the burgeoning population of the original parish of St Pancras, and by 1890 it had been divided into 33 ecclesiastical parishes. 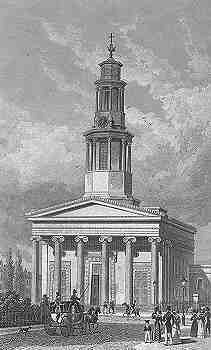 St Pancras New Church soon after completion in the 1820s. The New Church was built primarily to serve the newly built up areas close to Euston Road, especially parts of the well-to-do district of Bloomsbury. The building of St Pancras church was agreed in 1816. After a competition involving thirty or so tenders, designs by the local architect William Inwood, in collaboration with his son Henry William Inwood, were accepted. The builder was Isaac Seabrook. The first stone was laid by the Duke of York at a ceremony on 1 July 1819. It was carved with a Greek inscription, of which the English translation was "May the light of the blessed Gospel thus ever illuminate the dark temples of the Heathen". The church was consecrated by the Bishop of London on 7 May 1822, and the sermon was preached by the vicar of St Pancras, James Moore. The total cost of the building, including land and furnishings, was £76,679, making it the most expensive church to be built in London since the rebuilding of St Paul's Cathedral. It was designed to seat 2,500 people. The church is in a Greek revival style, using the Ionic order. It is built from brick, faced with Portland stone, except for the portico and the tower above the roof, which are entirely of stone. All the external decoration, including the capitals of the columns is of terracotta. The Inwoods drew on two ancient Greek monuments, the Erechtheum and the Tower of the Winds, both in Athens, for their inspiration. The doorways are closely modelled on those of the Erechtheum, as is the entablature, and much of the other ornamentation. Henry William Inwood was in Athens at the time that the plans for St Pancras were accepted, and brought plaster casts of details of the Erechtheum, and some excavated fragments, back to England. The church pictured in 1948. The west end follows the basic arrangement of portico, vestibules and tower established by James Gibbs at St Martin-in-the-Fields. The octagonal domed ceiling of the vestibule is in imitation of the Tower of the Winds, and the tower above uses details from the same structure. At the east end is an apse, flanked by the church's most original features: two tribunes designed in imitation of the Erechtheum, with entablatures supported by caryatids. Unlike those on the Erechtheum, each caryatid holds a symbolic extinguished torch or an empty jug, appropriate for their positions above the entrances to the burial vault, There is a stone sarcophagus behind the figures in each tribune, and the cornices are studded with lion's heads. The caryatids are made of terracotta, constructed in sections around cast-iron columns, and were modelled by John Charles Felix Rossi, who provided all the terracotta on the building. The upper levels of the tribunes were designed as vestries. Access to the church is through three doorways ranged under the portico. There are no side doors. Inside, the church has a flat ceiling with an uninterrupted span of 60 feet (18 m), and galleries supported on cast-iron columns. The interior of the apse is in the form of one half of a circular temple, with six columns, painted to imitate marble, raised on a plinth. The crypt, which extends the whole length of the church, was designed to contain 2,000 coffins, but fewer than five hundred interments had taken place by 1854, when the practice was ended in all London churches. It served as an air-raid shelter in both world wars and is now used as an art gallery. The church was closed for two years from 1951 for structural renovation made necessary by dry rot and war damage. The North Chapel was added in 1970 and the interior was restored in 1981. The steps of the church were one of several sites used for floral tributes after the 7 July 2005 London bombings. The building in Grade I listed. St Pancras is still in use as a place of worship. Revd Anne Stevens is the current Vicar. It also has programme of concerts. The church is one of the most important 19th-century churches in England and is a Grade I listed building. However, because of its situation on Euston Road, one of London’s busiest roads, it has become stained with pollution and recent cleaning attempts have been unable to remove the staining of much of the Portland stone. In recent years the Church was used as the location for the nearby University College London Christmas orchestra performances, and has from 2006 hosted the University's Christian Union carol services. ^ a b Historic England. "Church of St Pancras (Grade I) (1379062)". National Heritage List for England. Retrieved 27 January 2015. ^ Gavin, Stamp (1983). The Changing Metropolis. London: Viking. ^ Palmer 1870, pp. 23-5. ^ a b c d e f g h Britton, John; Pugin, August (1825). Illustrations of the Public Buildings of London. 1. London. pp. 154–166. ^ "Ceremony Of Laying The First Stone Of St. Pancras Church". The Times,. 2 July 1819. p. 3. ^ Summerson, John (1962). Georgian London (revised ed.). Harmondsworth: Penguin Books. p. 218. ^ "About the Crypt Gallery". Crypt Gallery. Retrieved 15 April 2011. ^ Historic England. "Details from image database (478428)". Images of England. Retrieved 22 January 2009. Palmer, Samuel (1870). St Pancras. London. Richardson, John (1991). Camden Town and Primrose Hill Past. ISBN 978-0-948667-12-1. Summerson, John (1988). Georgian London. ISBN 0-7126-2095-8. Wikimedia Commons has media related to St Pancras New Church. This page was last edited on 13 September 2018, at 00:24 (UTC).